Celsius® CFT Logistics brings the opportunity to manage large-scale freeze &amp; thaw processes in creating a reliable platform logistics for consistent operations. Celsius® CFT Logistics provide all elements of the platform to successfully move your drug substance from bag filling &nbsp;through draining at the drug product sites worldwide. Protected in robust structural frames, Celsius-Paks are automatically filled with the Celsius® Filling Station and moved through the facility in Transfer Carts to a Celsius® FT33|66|100 to be frozen. After freezing, the Celsius®-Paks can be transferred to Storage Modules for long-term protected storage in your walk-in freezers. From there, the frozen Celsius®-Paks can be shipped in Pre-qualified Shippers to its destination site for thawing into a Celsius® FT33|66|100 and finally moved to the draining operation. Celsius® FT100 is a controlled-rate freeze & thaw system designed to minimize the adverse effects of the cryoconcentration in your biopharmaceutical products. This modular equipment uses a patented heat transfer technology that provides unprecedented freeze and thaw performance and flexibility for processing up to 100 L of solution with single-use Celsius®-Paks. The Celsius® shippers provide robust and pre-qualified shipping solutions that ensure safe shipment of individual and/or multiple frozen 8.3L and 16.6L Celsius®-Pak to remote locations. 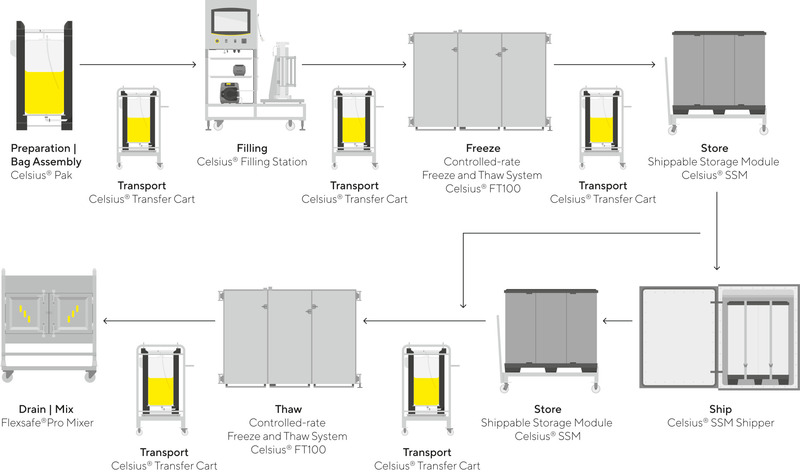 The Celsius® storage modules allow long-term storage of up to 100 L of product in frozen Celsius®-Paks on racks inside storage freezers to minimize footprint. The Celsius® Filling Station optimizes the logistics of filling and pressurizing production-scale Celsius®-Paks with minimal operator intervention. The Transfer Carts are designed to minimize the operator efforts when transferring Celsius®-Paks between the equipment and accessories of the Celsius® CFT platform. Celsius®-Pak Frames and Accessory protect the contents of Celsius®-Paks throughout its lifecycle during all processes.